Sania recently posted some pictures of her 'Not A Baby Shower' moments. Indian Tennis star Sania Mirza is all set to welcome her first child with husband, Pakistani cricketer Shoaib Malik. From posing for fashion magazines to her throwback posts on her Instagram, the mom-to-be seems to be super excited to take up the new role. Sania who is known for keeping her Instagram ticking with wonderful posts recently posted some of her 'Not A Baby Shower' moments. In the recent Instagram posts, the tennis star shared pictures and videos from her Pyjama party where she can be seen having a gala time with her friends and family. 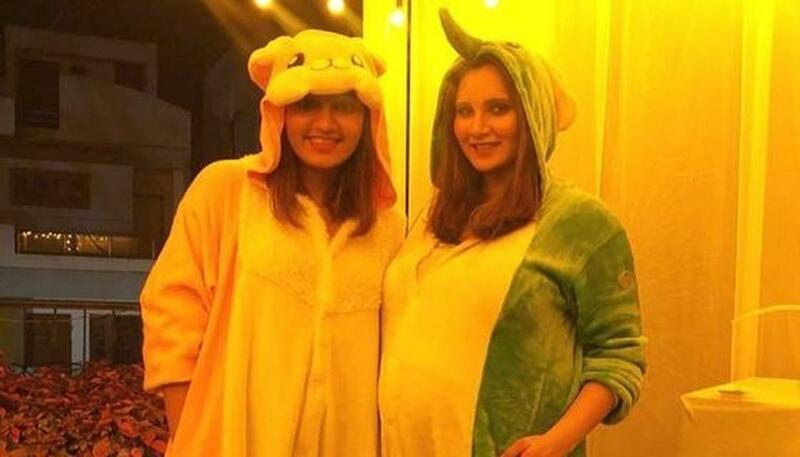 Sania shared pictures from the event where she can be seen donning an animal pyjama set, and her sister Anam too accompanied her wearing a similar outfit. While Sania opted for a green elephant outfit, Anam wore a pink bunny one. The mom to be posted a slideshow of pictures celebrating the moments and captioned the post saying, "We come in all shapes and sizes but these are all my constants ❤️😂 thank you guys 😘😘 #pyjamaparty#NOTababyshower 🤷🏽‍♀️"
Sania's Instagram stories and videos gave her followers a sneak-peek into the private celebration. Special arrangements were made for a fun night. While the whole place was decorated with lights, live performances and movies were arranged to enhance the charm of the evening. However, the father-to-be, Shoaib Malik was not spotted at the event. Sania in her Instagram post revealed that he was busy executing some 'duty' which is a priority. As she shared a video of her cake-cutting, she addressed her husband in the post and wrote, "My life ❤️ missed you @realshoaibmalik but duty comes first 🤗 @anammirzaaa @nasimamirza@imranmirza58". In fact, Sania's sister Anam also took to Instagram and shared pictures from the event. Dressed as a bunny she was seen singing for the mom-to-be. In the post, she wrote, "Be whatever you want, they said. 😎 Bunnyyyy 🐰 #babymirzamalik#pyjamaparty". The posts from Sania's fun moments have been highly appreciated by her fans and followers. They congratulated the mother-to-be and extended their best wishes. Sania and Shoaib are expecting their first child in October 2018.